Are you looking for Samsung Bypass Google Verify APK? 樂 Then the good news is that you are in the right place. 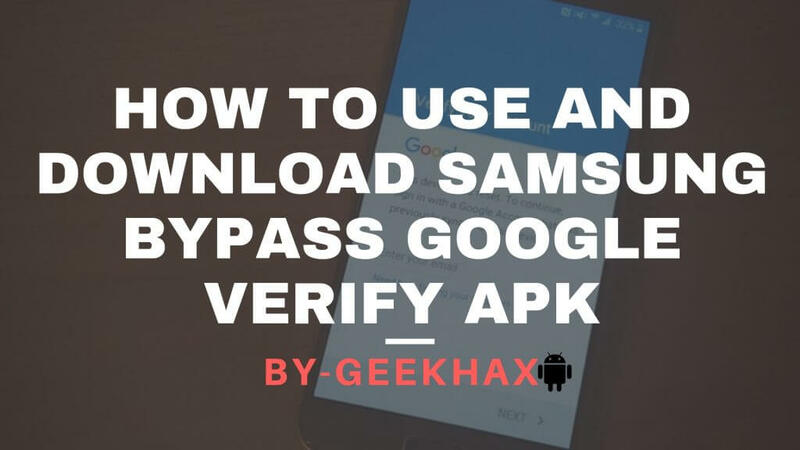 Samsung Bypass Google Verify APK is an app which is used to bypass Google’s FRP lock in all the Android devices available today in the market. Now, before heading into the tutorial, let us first have some information about the FRP lock and other details that you should know before using this technique to bypass this security feature. 1.1 How does FRP Lock works? 1.2 What Do You Need To Know About FRP Lock? 1.4 Difference Between Samsung Reactivation Lock & FRP Lock! 3 How does Samsung Bypass Google Verify APK Works? 4 How to use Samsung Bypass Google Verify APK to unlock your phone? 4.1 #1: Using a Bypass Tool for Samsung Bypass Google Verify. 4.1.1 Note- For using this technique, you must have an OTG cable. FRP lock (known as the Factory Reset Protection Lock) is a security mechanism which is used in Android devices to provide some built-in security features to its users. This security feature includes protection of your device and information, including screen locks and data encryption. This feature ensures that nobody can factory reset your phone if lost or stolen. The FRP feature Lock features are available on all the Android devices running in Lollipop 5.0 or higher version. The good thing is, nowadays, all the mobile manufacturing companies are implementing this FRP Lock security feature in their devices to increase the level of protection of its user data. In any case, FRP is activated, and unfortunately, your Google Android mobile is reset through the recovery menu, the Android mobile phone then will demand you to re-enter the Google username and passwords which were previously on the mobile device before it will successfully boot up again. This means that if someone steals your mobile phone and resets it from recovery, there is no chance for them to use it. How does FRP Lock works? If you have a Google Account set up on the device and the FRP Lock is active. This means that after the reset, you’ll be required to log in to the Google Account using the username and password. The good thing is that if you have multiple Google Accounts set up on the device, you can log in using any of the accounts. What Do You Need To Know About FRP Lock? Well in any case, if you want to reset your device to factory defaults, make sure you know your Google Account and password because you’ll need to log in at the end of the reset. Check your device’s Account settings for your account name, and reset your password via the device or at http://www.google.com. It can take 24 hours for the password reset to sync with all devices registered to the account. If you know your Google account’s username but can’t remember the password, then you can reset your password on the device, or at www.google.com. It can take up to 24 hours for a new password to sync with all devices registered with that account. After 24 hours, you can try logging in to your phone with the new password. If you have multiple Google Accounts, and you can’t remember which Google Account you used to set up on your device, then visit https://www.google.com/android/devicemanager. Log in with your Google username and password and check the list of devices registered to that particular account. If you do not see the device listed on the account, it means the device is registered to a different account. Use the same process to check for devices linked to your other Google Accounts. When you find the registered account, use it to log in to your device. Difference Between Samsung Reactivation Lock & FRP Lock! Well, both Samsung Reactivation Lock and FRP lock have the same use, but there are some minors differences between them which most of the people are not aware of. To make things more clear, here we have provided some detailed information on the difference between the two. Accounts Required. Samsung account is required to enable this feature. Only google account is required to use FRP Lock. Action when SIM is changed. Samsung account login is compulsory. No login is required. Availability Available only on Samsung devices. Available on Samsung as well as other Android devices. Device location. Device location can be traced if it gets lost or stolen. Device location cannot be traced. Use of previously used accounts. Previously set-up Samsung account is required to activate the device in case of any unauthorized activity or factory reset detected. Previously set-up Google account is required in case of factory reset of the device. Now, to get yourself out of this issue, you need something which will unlock your phone instantly and efficiently. This is where the “Samsung Bypass Google Verify APK” is helpful which is a fast unlocker FRP bypass app. How does Samsung Bypass Google Verify APK Works? You know that it is required to log in to our previously used google account to unlock the device after performing a factory reset. So, how will the Samsung Bypass Google Verify APK help you the unlock the device without the account details? How to use Samsung Bypass Google Verify APK to unlock your phone? #1: Using a Bypass Tool for Samsung Bypass Google Verify. First, we’re going to use a tool which is known as the “Factory Reset Protection Bypass Tool” – possibly the best tool for the job. One of the main reasons for using this tool is that it has been developed specifically for Samsung bypass Google verify. Note- For using this technique, you must have an OTG cable. First of all, download the Factory Reset tool from the link given below. Save this file to your computer and transfer it onto a USB flash drive. Since you have just factory reset your device, you will be asked to select a language. Go ahead and do so before tapping on “Start”. Next, you’ll be asked to insert a SIM card or check if your SIM card. For the time being, you can click on “skip”. Now, you will be asked to connect a Wi-Fi network. Connect to any network of your choice before clicking on “Next”. Now, you will have to accept the EULA (End User License Agreement). Simply check the “Yes” box and click “Next” to continue with the process. Now, you will come to the part where Google will ask you to verify your account. Connect an OTG cable to your Android device and connect the USB flash drive from the start of the method. When your Android device detects that you’ve connected a USB flash drive, it will open up a file manager. Browse the flash drive and locate the FRP file(that you have recently downloaded from the above-given link) which has the file extension “.APK”. After locating the file, select it, click on “Install”, and tap on “Open”. Now you will be taken to the “Settings” application and from there, scroll down to “Backup and reset” menu. tap on it, and then select the “Factory data reset” option, followed by clicking on “Erase Everything”. Your device will now factory reset again. But this time, the good news is that you won’t be required to enter your Google verification information. Boom, you have successfully learned how to Bypass Google Login details just by using the “Samsung Google Bypass Verify APK”. Well, it might happen that you do not have any OTG cable to use method#1 to bypass your Google account. Then, what can you do now? Don’t worry; I have got a solution for this. The following two methods (method #2 and method #3) can be performed without the need of any OTG cable. Firstly, connect your Android device to your computer using a USB data cable and download these two programs “Realterm” and “FRP Tool“. Now, install the programs and then launch Realterm. Now, you need to enter your device’s port code. To do this, open device manager from “My computer”. On Device Manager, search for the menu “Modems”, tap on it and then, click on “Samsung Mobile USB Modem”. Now, right click on it and you find an option named “properties”. Click on the “Modem” tab and you will see the device’s port code. Please note down this code somewhere as it is required in this process afterward. You can now close the “Device Manager” window. Switch back to the “RealTerm” application and search for the “Port” tab and enter the port code there and then click on the “Change” button. Now, you have to click on the “Display” tab and from there, check the “Halt Duplex” box. Now the final step, click on the “Send” tab and enter “at+ creg?\r\n?” into the box at the top-right. After entering the given text in the box, click “Send”. Note: If the step given above does not work, then enter “atd1234;\r\n” and click on the “Send ASCII” button instead. Now, you should see the dial pad appearing on your device’s screen. This means you have successfully used this technique to Bypass Samsung Google verification. If the above two methods do not work, then you can use this software named “Dr.Fone Toolkit” to bypass the google account verification of your phone in which you performed a factory reset. Connect your device using any USB cable of your choice. Install and run the software on your computer. After opening the program, search the “Unlock” button from the menu and click on it. Now, click on the “Start” button to begin the process. Now, to ensure that this process is successful, you must put your device into “Download Mode”. To put your phone into Download mode, turn off your phone first. Then hold the Volume Down, Power, and Home buttons together at the same time. When the warning message appears on your display, press the Volume Up button. You have successfully entered Download Mode. After your device enters the Download Mode, Dr.Fone will automatically start downloading the necessary recovery package required to bypass the verification screen. Now, you will have to relax since all the work will be done by Dr.fone to bypass the google account verification. Congratulations, your device is now successfully unlocked and is free to access any way you like. If you are a kind of person who regularly needs to delete his/her login credentials and bypass the Google account verification, then I would recommend you to use Method #3. It is the simplest way to get your job done. Moreover, almost all the work is done by Dr.fone itself. Keep Visiting GeekHax For More Interesting Android Tricks. Please give your valuable feedback in the comment section below and help us to improve in our upcoming posts.